Of course, I had to check it out. The premise is people who are out now showing old pictures of themselves when they were pretending to be straight — or simply hadn’t figured out how to come out of the closet. 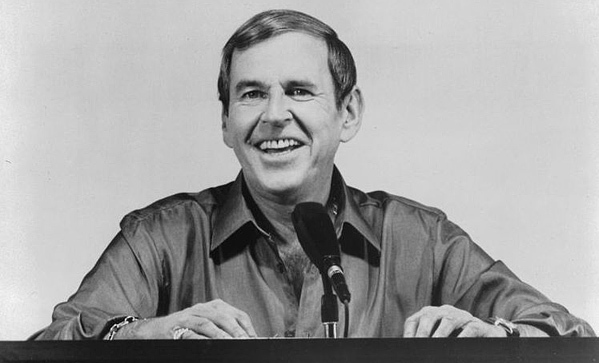 TV’s center square, Paul Lynde, was bitchy and campy and threw out one double entendre after another on The Hollywood Squares for years. Also known for stage and TV work, including memorable turns as Uncle Arthur on Bewitched, Lynde died of a heart attack in 1982 at age 55. |Image: crewmagazine. 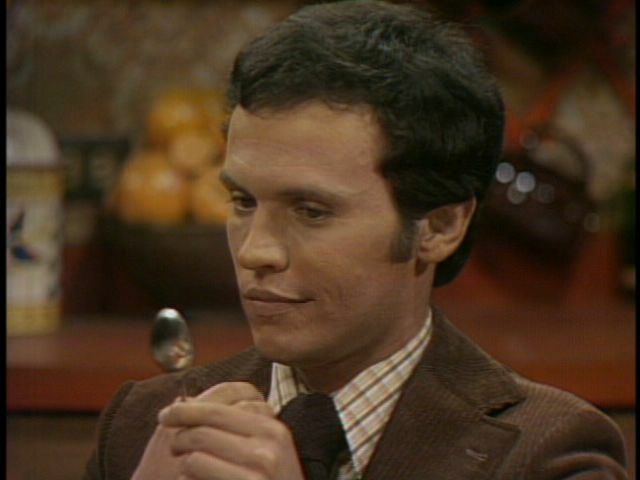 Billy Crystal as Jodie Dallas in Soap. Allegedly gay throughout the series’ 1977-81 run, Jodie had several relationships with women. Granted the show was an over-the-top spoof on soap operas, but commercial director Jodie was nobody’s idea of a role model. Things weren’t that much better in the 80s, when Steven Carrington on Dynasty was television’s gay standard bearer. Carrington — played by Al Corley and then recast with Jack Coleman — like Jodie Dallas before him, had far more romantic entanglements with women than any gay man I’ve ever met. Then again, “conversion therapy” and attempts to go straight were seen as serious back then, as ridiculous as it sounds now. There was no touching, no actual affection shown between two men on TV then; not in those days when, after his 1985 death, the world was shocked to learn that Rock Hudson was gay. Looking back on those “straight years,” I think that simply because they were there and we could have a conversation about them, Jodie Dallas and Steven Carrington began to pave the way for networks like HERE and LOGO and superstars like Ellen Degeneres and Rosie O’Donnell and Zachary Quinto and George Takei and Anderson Cooper and Neil Patrick Harris and shows like Glee and The New Normal and Will & Grace and Brothers & Sisters and The L Word and Queer as Folk on cable and the networks and Husbands and The Outs and Eastsiders and Submissions Only and Hunting Season online and iconic couples like Kevin and Scotty, Luke and Noah, Lindsey and Melanie, Will and Sonny and, hell, Jack and Doug on Dawson’s friggin’ Creek just to scratch the very tip of the iceberg. I finally figured it all out in my mid-20s and came out publicly after attending the 1993 gay march on Washington. Being surrounded by the largest crowd I’ve ever seen on the National Mall, I decided that I wasn’t alone. I had back up in case coming out was a terrible idea. It wasn’t. It NEVER is. I just wish my “straight years” hadn’t lasted quite so long. Maybe they wouldn’t have if I could have seen more of myself on television, in the movies or in literature back then. 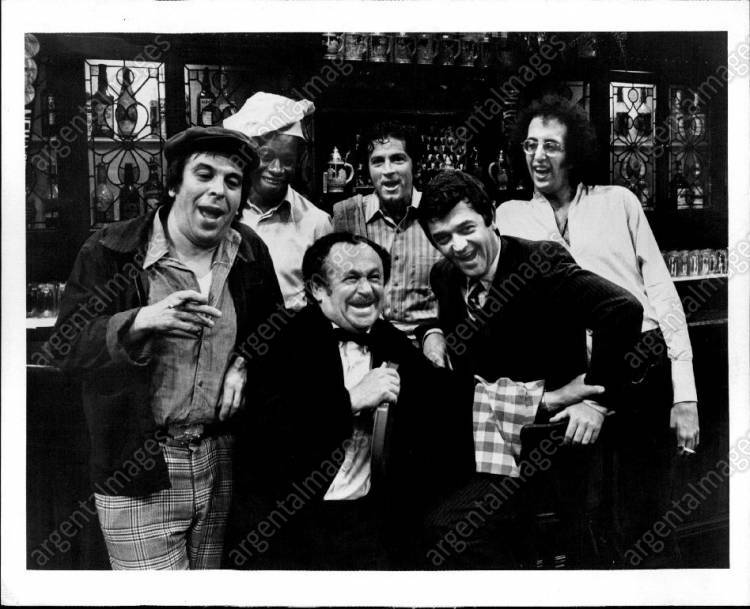 The Corner Bar was a 1972 summer replacement series on ABC that is credited with the first recurring gay character on American television. Played by Vincent Schiavelli, “Peter Panama” was reviled by gay activists at the time for playing up all of the worst gay stereotypes. Schiavelli, far right, is pictured with cast members Gabriel Dell, J.J. Barry, Shimen Ruskin, Bill Fiore and Joe Keyes. |Image via sticomsonline.com, watermarked argentaimages. 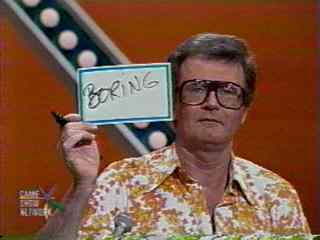 This entry was posted in Commentary, Gay, Humanity & Humanism, LGBT, Sitcoms, Social Justice Issues, Television, Video and tagged entertainment, gay, LGBT, straight years, tv. Bookmark the permalink.